February 29, 2016 – Our time machine for this trip is tricked out like James Bond’s Aston Martin, and we’re speeding back to the height of the Cold War. Our driver on this journey is Paddy Hayes, who was kind enough to call into the show from Dublin, Ireland. 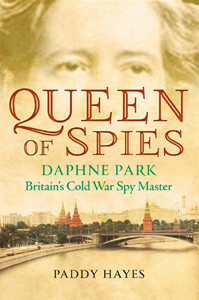 His book is Queen of Spies: Daphne Park, Britain’s Cold War Spy Master. Daphne Park was Britain’s top woman spy, the most senior lady in MI6, a spitfire who people said once met, was never forgotten.